Friday is almost always Pizza Night in my home. Like many families, we have our favorite homemade recipe which I use to make pizza and calzones. As a snack, I’ve taken little bits of dough, rolled them into shredded cheddar cheese, baked them at 350 for 20 minutes, and served them with tomato sauce or salsa on the side a.k.a. cheese rolls. Any of these recipes can be made with the assistance of children or by the children themselves. Typically, I let my 6 and 8 year olds spread the sauce while the 4 and 5 year olds sprinkle the cheese. My 8 year old helped me make the calzones by helping with the entire process. 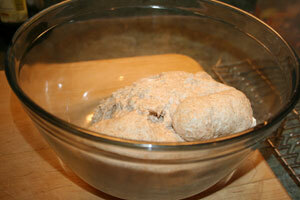 The homemade pizza dough in my favorite Anchor Hocking mixing bowl after rising for an hour or so. 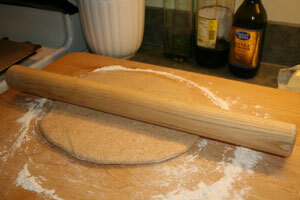 I roll the dough out on a well-floured wooden board. I keep mine on the counter. Sometimes I prefer to work at the kitchen table which is lower. Once I’ve rolled the dough into a 6 inch circle, I often use my hands like the pizza guys do to loosen up the dough and make the circle bigger. My goal is to have a 10 to 12 inch circle. 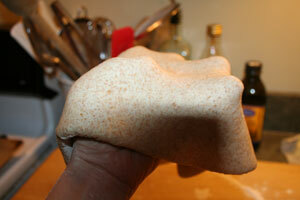 And no, I do not toss my dough. My kitchen floor is a little too dirty for that. 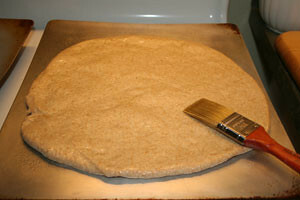 I place the pizza on a greased cookie sheet sprinkled with corn meal and wipe olive oil over the crust. Voila! 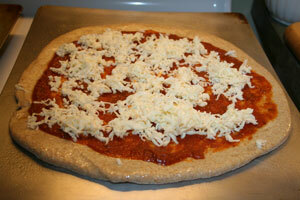 A pizza ready to go in the oven. I like to preheat my oven while making the pizzas. Since I make 4 at a time to feed our family of 7, preheating keeps the process making faster and the pizza stays warm longer.